Thirteen inch ereaders are few and far between and far outside my budget, so when the Onyx Boox Max went up for pre-order a couple weeks back, I immediately begged to borrow a review unit. This 13" ereader retails for $650 plus shipping and VAT, putting it far outside my budget. I got the Max on Tuesday, and started thinking about the review on Saturday night. Five days is not nearly long enough to really plumb the depths of a device as complex as the Max, but I have a good excuse for writing the review this early. The review unit died Friday night. We think it's just a loose cable, but since I can't use the Max right now I decided to take a few minutes and share my thoughts. This is going to be a difficult review to write. The Max is not an ereader, not in the way you think of an ereader or use one, and I don't think it fits into any predefined category. I haven’t had such a category-breaking device since the Entourage Edge, that dual-screen textbook reader from early 2010. The Edge was a well-conceived device with solid hardware and software, but it flunked out with a lot of reviewers because they couldn't grasp its purpose or function. They approached it as an ereader, and tried to compare it to a Kindle, when in fact the Edge was a niche product designed to serve just one market. 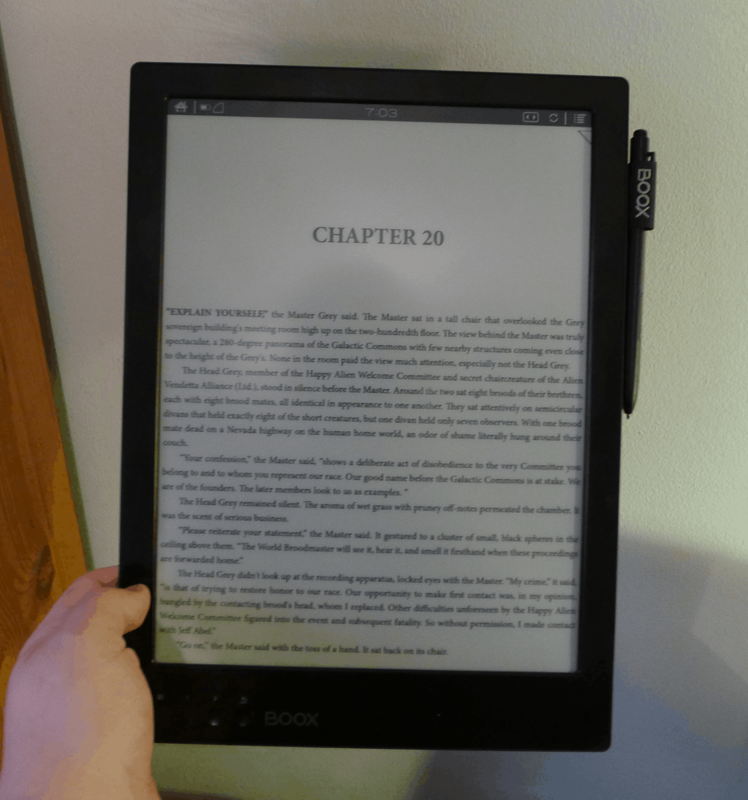 If you are looking to buy a Max, I suggest that you avoid the mistakes those reviewers made, and set aside any preconceptions that the Max was made for reading ebooks. Based on my time with it, I would say that it is more of a document viewer than an ereader. Its sheer size precluded me from using it as an ereader. This is more of a device that you would hold up and use for showing off blueprints, or one which you would use to proof a document a page at a time. You might also lay it on a table, and have several people looking at the screen at one time. Now that I have used the Max, I can understand why Pocketbook has branded their large ereader as a blueprint reader for the construction market, and why the Sony DPT-S1 only supports PDF and is targeted at the business market. I think both Sony and Pocketbook built a prototype, started using it, and realized that they would have more success if they focused on a limited number of use cases. That's why they refined their software to better support those use cases (the Pocketbook CAD Reader has yet to be released, but still). A device built around a 13" E-ink screen is not a product for the broader ereader market, so it made sense for Sony and Pocketbook to focus on niche markets with specific uses. And luckily for Max owners, they can define their own niche uses (including ones I have't thought of). The Onyx Boox Max is an open Android device. It runs Android 4.0 on a 1GHz CPU. You can install third-party apps, and it also comes with Google Play. I didn't get a chance to test app compatibility with the review unit, but I do want to point out that potential owners should think about the apps they might install, and the abilities and features those apps would add to the Max. Max owners can define their own niche uses for the Max, and so while I might declare what the Max is not, I can't tell you exactly what it is. We really don't know yet. Did you try OneNote for android? That would be a use case all by itself if the battery life holds up. I didn’t get a chance. Did you try opening blueprints on it? How responsive was it? On Sony DPT-1, blueprints look great but the device is painfully slow with larger files. I tried a 200MB PDF in Onyx’s reading app. It was painfully slow, yes, but it did work. Would be just the size needed for reviewing legal documents from PACER. You may say of course, but I can recall way back when the Sony Digital Paper was released. A lot of us were upset by the PDF-only limitation. Now that I have a 13″ device, I can see how wrong we were. It’s tough to justify something like this over an LCD tablet with faster CPU, up to date OS, etc. Oh yeah, and color. It IS tough to justify,and almost crazy on the face of it v cost and higher capability of tablets. But, as my Kindle packed in a few weeks ago, I’m finding I just can’t face reading books on my tablet after a day of work at a screen – so I’m considering getting a Boox Max to ensure I don’t miss out on the joy of reading, and can even use a lot at work to cut down on the screen time there. There Nate touches on something – a 13.3 screen could start to have a lot of new uses. Tablet guys seem to say a lot about the efforts they are making re screen glare/sleep patterns- Nate have you written things on whether that seems overstated? I’m suspecting that it is. What is more worrying is that your Boox broke- my Kindle lasted years and seemed incredibly stable kit right up until the day I sadly squashed it. How reliable have other Onyx models been? How well does A2 no-refresh mode work when word-processing and browsing? Can you plug a keyboard into it (or via BT) and how well does it work? Can it be used as a secondary screen for a laptop? I didn’t get much of a chance to test the Max as a second screen monitor. I had tried a couple apps, but neither had worked (they installed, but the screen waa black). Android 4.0 is truly ancient. What are they thinking? category breaking ? imagine this device in a configuration like the edge in a fold/flip portfolio. on the other side put a paper/digital capture device like the “DigiMemo L2 8-1/2-by-11-Inch Digital Notepad” (ok, i cut and pasted one of the ads on tdr…), and BECUASE the boox max is running android (4.0 ? really ? ), run evernote/onenote/whatevernote . that is a device i would hapily drop my less than hard earned money for. You lost your Max,I know.It turned your posting to be a philosophical thought,I know!Please stick to your nano inch gadget and enjoy the rest,while there are others who desperately waited for a long time for a 13 inch screen model.Your written posting is your lullaby for soothing yourself,I know! It is really admirable how humble is your “review”. Aside, likewise you stated in the post referring the Pocketbook Cad, I do not understand why business people or engineers would prefer this device to an Ipad Pro 12.9 inches (more dynamic and apt to use it in short periods of time). Also, I am worried e-ink is no more an attractive technology because, these days, some people are questioning whether back lit displays are not eyes damaging, which is the principal advantage of e-ink screens. Sorry, maybe I have not asked it explicitly enough: do you think back lit displays are not eye damaging? Recent news have questioned it. I preordered it. We’ll see what it can and cannot do. I’ll tell you exactly where this product is going to shine. Academia. There are millions of e-textbooks and academic articles out there, and there isn’t currently a device properly displays them. Short of printing them out, there really isn’t any good way of annotating them. Not to mention the eye-strain of reading books on a monitor. And those books, articles, and annotations can be made searchable, organized easily and carried anywhere. I have, conservatively, 500 pounds of books. I also have a rather large e-textbook collection that I haven’t made a dent in because I don’t enjoy reading on a monitor. Another use case is taking notes in class, as the Android operating system will have keyboard support in addition to the stylus. I like to use a keyboard anyway so I can keep crisp notes. Soon, I’ll also be able to draw diagrams. And unlike an LCD tablet, the battery will last more than a couple of hours without requiring a charge. No, this one is a clear winner, and I won’t even care about the poor refresh rate. Once the price is right, it will be an educational game-changer. You see?Your rough guess is like your postings!Shallow,personal,not informative,as almost always! Next time,when publishing another post,have a look around.Your big brother is watching you.Be advised that this is not a troll,but rather warning! I wonder somehow you intentionally like to make fun of Onyx,as an Icarus fanboy! I do not understand what has offended you, and you have not specified what you have issue with. We are all intelligent human beings here, so instead of slander, let’s discuss while being polite and civil. Nate has given an honest opinion: this really is a device that isn’t anything like a standard ebook reader which you can use on a bus or train – it’s just too big. This is something that due to its size, it is a new category in it’s own right. So, what is this category? If you can think of something that it will be ideal for, let’s give suggestions. Eye strain might not be a serious medical condition, but from my personal and my friends experience, it is still an issue for those who read long hours every day. One simply cannot read one or two 70 pages articles or a 100+ pages book on an LCD screen. You don’t need a scientific study to determine such a simple fact. Besides, after two to three ours of intense reading on your computer, you get very tired, that is much sooner than when you read your texts on paper/e-paper. It is said that if the bright of an LCD is down enough, it does not hurt your eyes. Aside, you can put a background color you are confortable with. I tend to avoid them as well, and this is why. Two things going for the Sony DPT-S1 are (1) it’s lighter (12.6 vs. 17.5 oz) and (2) it’s inductive + capacitive, so easier to navigate with your fingers. Also worth mentioning is that since it’s from a reputable company, both hardware and software are likely to be more refined. Even though all the 13.3″ Netronix clones have Android, it’s still only Android 4.0 and I doubt the user experience for the vast majority of apps to be all that good on an e-ink screen since they are optimized for color screens with fast refresh. Now that you can get the DPT-S1 for “only” $699, it’s starting to reach the you’re-not-insane level :). As a writer who lives in a sunny climate and regularly wishes to read, research and write outside, the Onyx Boox Max is what I have been waiting for decades! Another key application is for taking notes in meetings and elsewhere. All current devices are unsatisfactory which is precisely why in 2016 we are still using pen and paper even on the stands in computer shows! Because a tablet and BT keyboard covers that use case just fine. Or a laptop. Or, for some users, a smartphone. This isn’t enough to justify a 600 euro purchase. Unfortunately, tablets, laptops or smartphones don’t cover the use cases I give which is why so many people are still using pen and paper to take notes in meetings and in various other situations. In particular, their battery life is too low and they suffer from the other disadvantages I listed before. In my case, I need to do reading, writing and researching on the move, and often for long periods at a stretch. None of the existing devices works for me well. The screens of my netbook, tablet and smartphone are not big enough. Laptops tend to be too heavy and too hot. The batteries of all these devices die all too quickly. And I find it difficult to work with them in sunlight conditions which is very often (I work in Turkey). An effective A4-sized e-ink device with external keyboard (especially if it was able to be attached in ergonomically efficient ways) would be a great solution for which I would be prepared to pay extra. And I think that it could become more popular than people realise. Unfortunately, the Sony 13.3 inch solution is not flexible enough and offers no support for external keyboards. The Onyx Max Book looks more promising although there has been criticism of its build quality, speed and resolution. That said, I am thinking about getting one when they become more available. Black and white A4 ereader – who wants them? Musicians! I’ve got thousands of pieces of music scanned or printed to A4 PDF. Smaller screens simply don’t cut the mustard. The fact that this can run Android apps make it my new “I WANT” sunshine device. Cheers all!